In keeping with the trends to more plant-based meals, this tasty recipe uses the “meatiest” mushrooms, portobellos. When cremini mushrooms (photo #3) are allowed to continue growing, they grow up into more complex-flavored portabellas, meaty in both taste and appearance (photo #2). Portabellas can be from 3 to 10 inches in diameter. Like meat, they even release juices when cooked. Vegetarians enjoy them grilled in lieu of beef, and they make wonderful grilled vegetable sandwiches. Portobellos are brown, with a slightly firmer texture than white mushrooms. They can be served whole or sliced, stuffed, or as “burgers” or “sliced steak,” as in the recipe below. For a simple yet delectable starter, serve sliced grilled portobello drizzled with a balsamic reduction. The mushrooms are cultivated and available year-round. You can have your plant-based steak and eat it, too, with this portobello “steak” recipe (photo #1). This recipe was created by Lindsey Baruch, a Los Angeles-based food photographer and recipe developer. She used Califia’s Go Coconuts coconut milk, a blend of coconut milk and coconut water, in the recipe. The mushrooms are joined by a refreshing green salad of watercress, mint and cucumbers. 2. PREPARE the salad. Slice the cucumbers and radishes and combine with with the mint and watercress. Add the lemon juice, salt and pepper and toss right before serving. 3. HEAT a skillet with a drizzle of oil. Cook the portobellos until charred and crispy on the outside and cooked through on the inside (you can eat them “rare” if you prefer). Let them rest for 5 minutes and slice as you would a steak (see photo #1). 4. SERVE with the salad, and a glass of red or white wine. 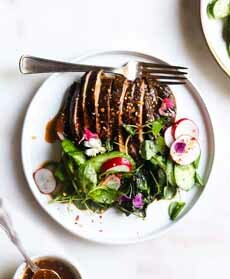 It may look like sliced steak, but they’re the vegetable equivalent: portobello mushrooms (photo courtesy Lindsey Baruch | A Life With Peace). 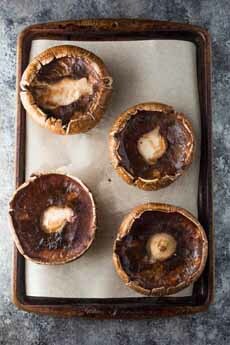 Portabella mushrooms (photo courtesy Sweet Peas And Saffron, which stuffs them with lasagna ingredients—here’s the recipe). 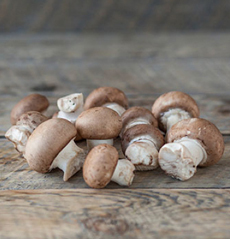 Cremini mushrooms (photo courtesy Good Eggs). 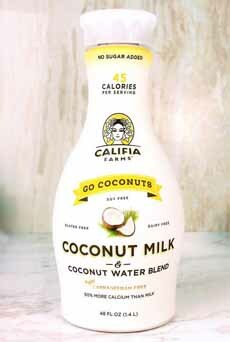 Califia’s Go Coconuts coconut milk (photo courtesy Milk And Eggs).